You'll be £7.45 closer to your next £10.00 credit when you purchase Charlie Peace. What's this? A devil once lived in God’s own county. A grotesque figure with many names and many faces, he could slip into the home of an unsuspecting family with the silent stealth of a cool night time breeze, and leave without a trace. Spending his nocturnal hours limping through the dirty streets with villainy on his mind, and impishly disappearing into the industrial smoke that hung over Victorian Sheffield like a perpetual storm cloud, this was a devil who was to write his own place in the folklore of his home town. Despite his fearsome reputation, this was a devil of flesh and blood. He was just a man, but a man with an unrivalled talent in the dark art of criminality and such was his fame for murder and mayhem, that he was the most wanted man in England for a time. Tales of burglary, murder, daring escapes, and a truly shocking miscarriage of justice feature in this biography, along with moments of lost love, damaged pride, and violent revenge. It is a story of a man who had turned to crime through necessity, but consciously chose to continue in an ever spiralling life of wickedness. Once immortalised in Madame Tussaud’s Chamber of Horrors, his gnarled and prematurely aged features would be the last image his victims ever saw, yet ironically, he was known by the name of Peace. 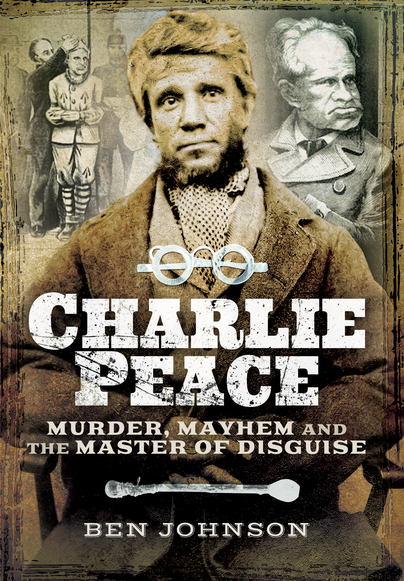 Author Ben W. Johnson became fascinated by this story and his book, Charlie Peace: Murder, Mayhem and the Master of Disguise, brings this intriguing tale onto our bookshelves and into our modern-day kindle devices. His style is light and refreshing, producing an engaging book and an interesting read from start to finish. Click me to read the full review. Ben Johnson is a freelance writer, columnist and sub-editor. He currently writes for two true crime magazines, and has a first class Honours degree in Journalism from Sheffield Hallam University. It was while studying court reporting that he found his love for the dark subject of true crime, and since these days of sitting at cold, silent press benches, has been a prolific writer, with articles being published on both sides of the Atlantic.